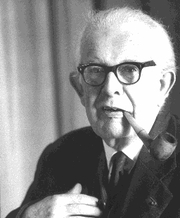 Jean Piaget was one of the most famous psychologists of the 20th century. He was originally a biologist who studied mollusks. He's best known for his studies of the intellectual growth of children and his influential theories of cognitive development. He published many articles and books, including The Origin of Intelligence in Children (1954). Jean Piaget is currently considered a "single author." If one or more works are by a distinct, homonymous authors, go ahead and split the author. Jean Piaget is composed of 7 names. You can examine and separate out names.